Troybery madness 2019 has started! Students can complete this bracket and submit via the Media Center Schoology Group. The Troy Middle School Media Centers are launching Troybery Madness 2019! We are continuing our new format that we launched two years ago for our Troybery reading program, now in its 19th year. 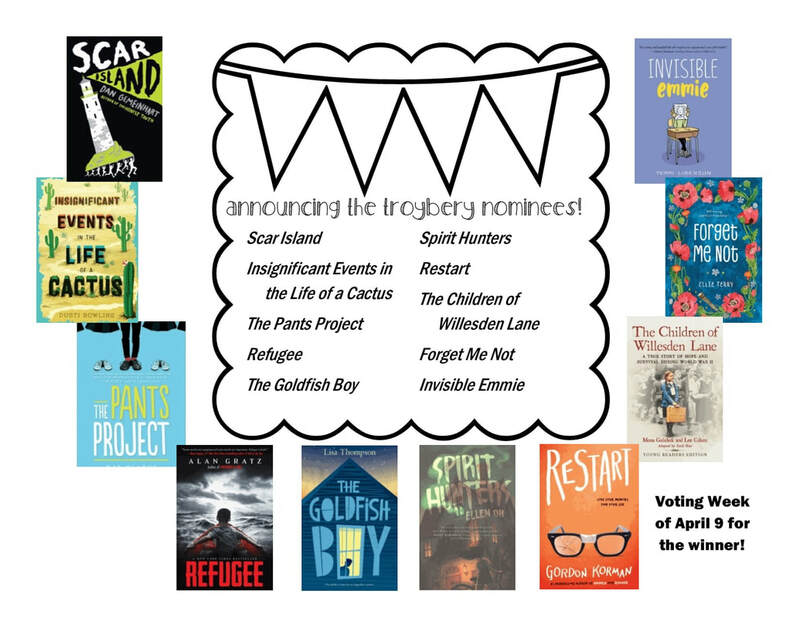 We have a field of 32 potential Troybery books, nominated by Troy students, teachers, and librarians—students will help us narrow down to the top ten through voting each week during March is Reading month. Books will be in competition just like the NCAA March Madness tournament, except that we will stop at the Elite 8 and do a vote for 2 wildcard spots to make it ten total. In order to vote, students will need to read at least 3 books out of the 32. Students have until Feb. 28 to fill in their brackets, so now is the time to really start reading!!! On the Media Center Schoology Group in the Discussion section, there is a place to submit the completed bracket. Even if students have not read all of the books, they can still try to guess which books are going to win! Our ultimate goal is to get kids excited about and interested in reading. We are proud that our program involves so much student voice in the creating of the list and choosing which books are the best! The voting starts March 1, so make sure your child has read at least 3 from this list in order to participate! ​Once we have narrowed it down to the top ten by the end of March, students will have time to read those titles in order to vote for the final Troybery winner in April. The Troybery Award winner will be announced live on April 26, 2019, at our annual ceremony. 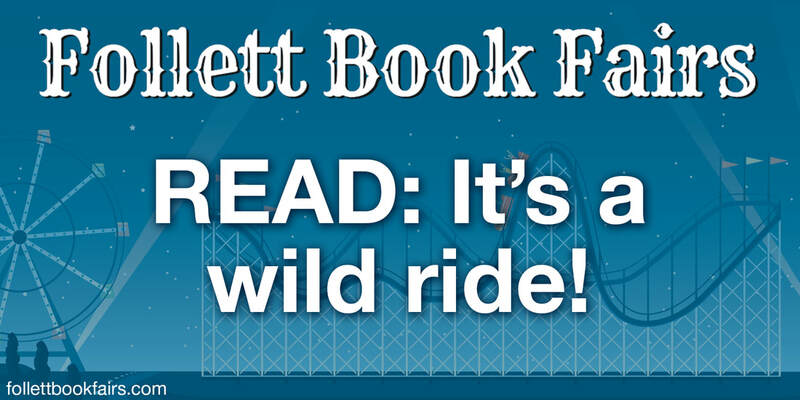 Introducing the Follett Book Fair! 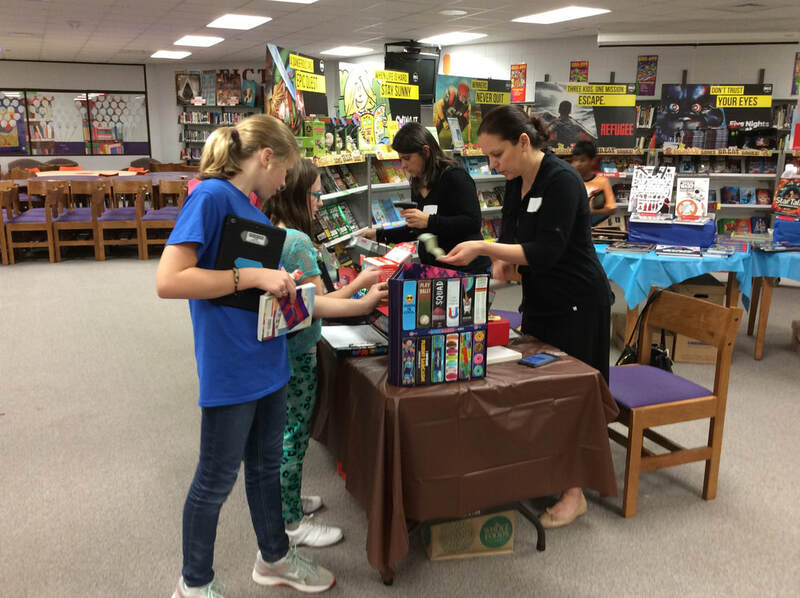 The Boulan Media Center will be hosting our first Follett Book Fair on November 26-30! Follett has been supporting schools for more than 140 years, which means you can expect an awesome selection of titles from a wide range of publishers. These are the books your kids want to read! purchase your child or teacher a gift card to the book fair! Visit http://www.follettgift.com to purchase a giftcard to use at the book fair for your child OR your teacher! ​Instead of sending your child with cash or a blank check, you can purchase a gift card and send the printout or text message with your child to make his/her book fair purchases. This would be a wonderful gift for grandparents and relatives to give to your child. Also, consider purchasing your child's teacher a giftcard, which he/she can use to buy books at the fair for his/her classroom library! Parents are invited to stop by the media center on our early release day, November 28, from 11 am-7 pm, to do some shopping! Your child can create a wish list for you when he/she comes to the fair with his/her class. We will have a SPECIAL guest during our shopping event: Troy PD's own Pawcifer Donut! 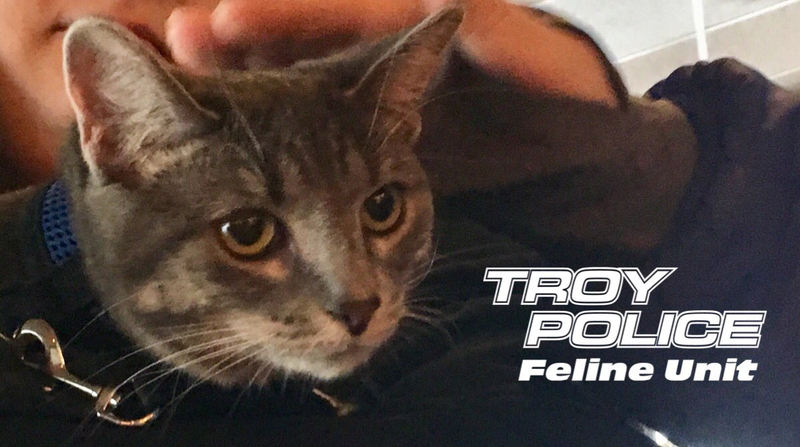 Come to shop from 11:30 am - 12:30 pm to meet our police department's adorable cat. We have released a list of potential Troybery nominees, and students are helping to narrow the list down to the top ten. Several of the potential Troybery books on this list will be available for purchase at the fair! Troyberys make great holiday gifts, because we only have 5 copies of each book in the media center for checkouts, so students have to wait a long time to get their hands on a copy. However, there may be books at the fair that are not on the Troybery list that should be!! If your child finds a book at the fair published in 2018 that s/he thinks should be a Troybery nominee, s/he can submit the title here. Would you like to honor your child's teacher by purchasing a book as a gift off the teacher's wish list? We will have a display listing the books at the book fair that each teacher would like to have in his/her classroom library. This would be a wonderful holiday gift for your child's teacher! It's Scholastic Book fair time at Smith! The Scholastic Book Fair will be coming to Smith's Media Center on November 26-30. With the theme of Enchanted Forest of Books, our library will be transformed into a wonderland of fantastic reading options. 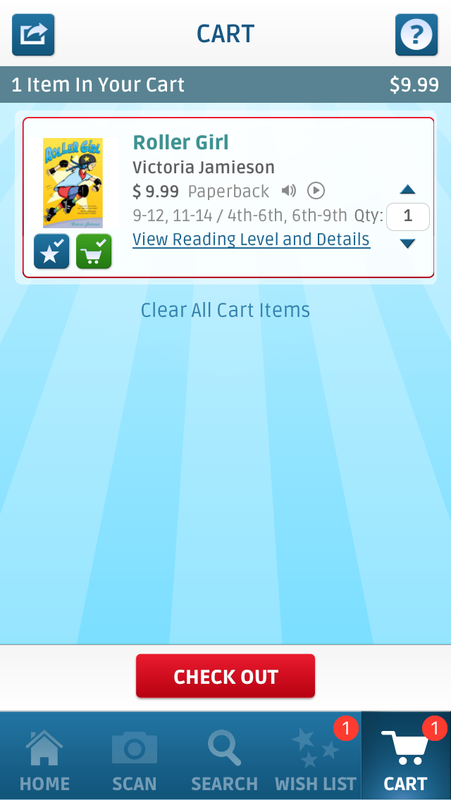 Be sure to load the book fair app on your phone or on your child's iPad! This free app will give you access to videos and podcasts about the books that will be at the fair, along with summaries, reading levels, and prices. Shop the fair using the pamphlet and the app with your child before you go! Students can create a wishlist using the app in order to show you what books they would like to buy. You can order directly from the app OR send money with them to make a purchase the next day at school. Orders from the app are shipped free to school in 2-3 weeks. 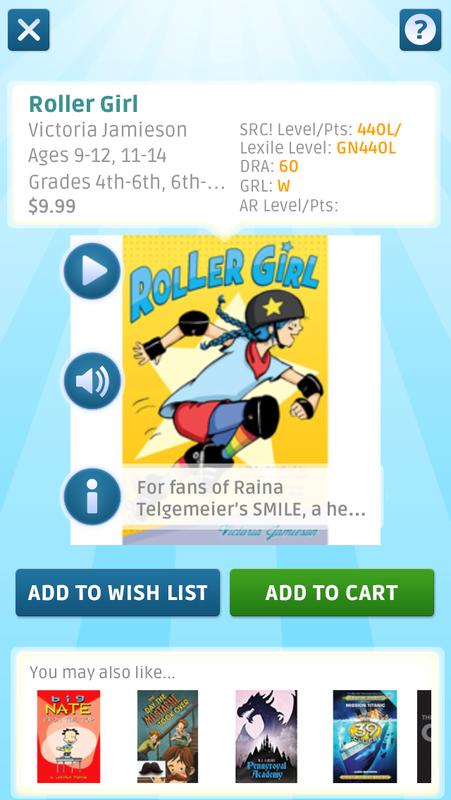 Search for books or scan books at the fair, then choose the Add to Wishlist or Add to Cart buttons. 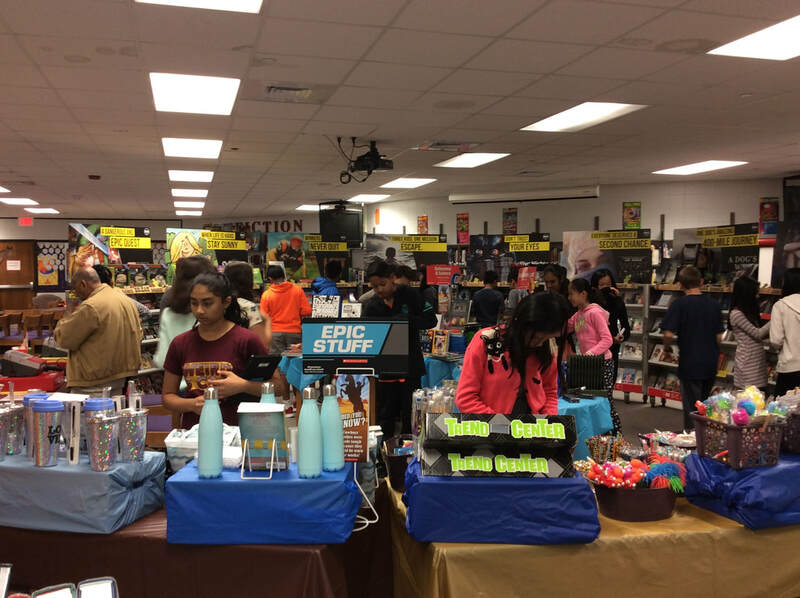 After adding books to your cart, click check out and choose the Smith Middle School fair to make your purchase. You can also order from our online bookfair November 16 -December 3, which has even more options available for purchase! Shipping is free, and your purchases will arrive at school in 2-3 weeks. NOTE: SHIPPING BEFORE WINTER BREAK IS NOT GUARANTEED. Mrs. Chatel will contact you for pick up. 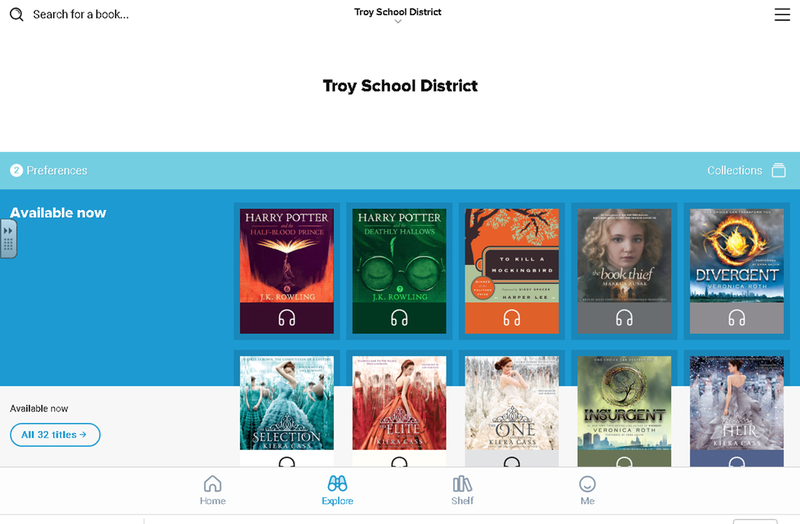 The TSD middle school media centers are excited to announce our new collection of OverDrive ebooks and audiobooks, now available through the Sora app! You might be familiar with OverDrive through the Troy Public Library--now, we have our own collection of books just for Troy secondary students. On September 18, Read an eBook Day, middle school students learned how to login to the Sora app (available through the App Portal on student iPads). If your child missed the instructions, you can find them here. Here are some of the titles available in our new digital collection in the Sora app. participate in the Big Library read! Please encourage your child to participate in the Big Library Read by downloading The Girl with the Red Balloon from the Sora app anytime between October 1-15! We will have UNLIMITED copies of the ebook available for our Troy middle school students, but it will only be available for checkout on those dates (and will be checked out for three weeks). You can also participate by downloading a copy for yourself through the Troy Public Library's OverDrive collection on the same dates. Please preview the contents of the book to determine its appropriateness for your child, as School Library Journal rates it as grade 7 up. For the first time ever, TSD students and staff were able to watch the Troy Middle School Media Center's annual Troybery ceremony live via YouTube on April 27, 2018. The 18th Annual ceremony boasted two author Skypes as well as lunch afterwards with a local Troybery author. 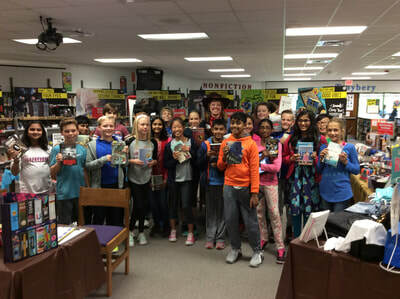 Teachers nominated their best readers to attend the ceremony on April 27, and thirty lucky students from each middle school were chosen from this list. Students who created original artwork or music inspired by Troybery books were also showcased at the hour-long ceremony. An emcee representing each middle school took a turn announcing the Troybery winners, following Deputy Superintendent Mark Dziatczak's opening speech. Many Troy students and staff were acknowledged during the ceremony for having perfect or close to perfect brackets during Troybery Madness or for being the one who nominated a book that ended up in the top ten. One ELA class at each middle school won a Skype with a Troybery author. 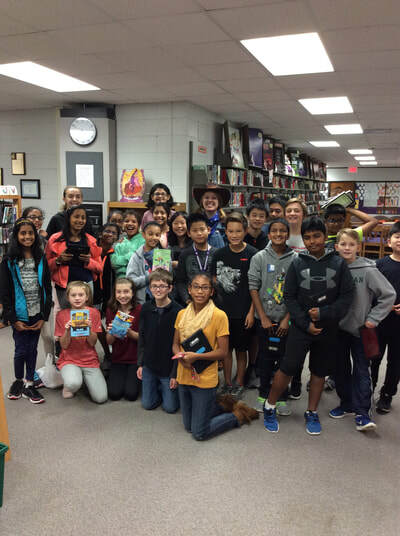 After Refugee by Alan Gratz was announced as the 2018 Troybery Award winner, students Skyped with Troybery authors Dusti Bowling and Lisa Thompson. Afterwards, students were treated to a presentation by author Supriya Kelkar, who wrote Ahimsa. Student were excited to get signed copies of her books and take pictures with her afterwards. To get down to the final Troybery winner, students cast 2,261 votes over 4 rounds of Troybery Madness voting. Overall, Troybery books were checked out close to 10,000 times this year. Troybery checkouts made up around 13% of all books checked out at each school. ​Troy School District middle school students certainly are avid readers, and the Troybery reading program continually motivates them, year after year. To nominate a book for Troybery 2019, visit this submission form. Want to watch the recorded ceremony? click here. Many thanks to the middle school teachers and administrators who have been so supportive of this reading program for the past 18 years. We are also grateful to the PTO of each middle school, the Troy Women's Association, and the Board of Education for their support. The Troy Public Library has been instrumental in getting Troyberys into the hands of our students when the media center's shelves were empty. Many parent volunteers were invaluable during Troybery voting and the ceremony. We appreciate all of the authors who made videos for our students, who donated autographed books and prizes, and who visited our students in person or via Skype. Finally, we thank the students and staff who participated in the program! After 3 rounds of voting and a total of 1,769 votes...Troy middle school students have chosen the titles for our official 2018 Troybery top ten list! Voting for the Troybery Award winner will take place on April 11 and 12 in the Troy middle school media centers. Students must have read at least 3 of the 30 books on the 2018 potential Troybery list to be able to vote. The media specialists will have some great prizes for those who participate. 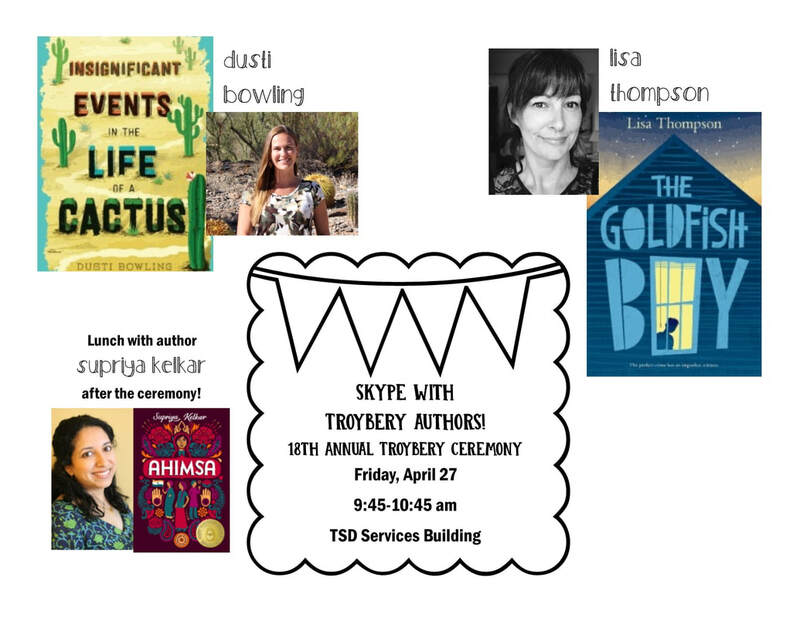 Students who go to the Troybery ceremony on April 27 will get to Skype with two Troybery authors, Dusti Bowling and Lisa Thompson, AND get to have lunch with author Supriya Kelkar, who wrote Ahimsa! NEW THIS YEAR: We will be live-streaming the Troybery Ceremony on YouTube so that all middle school students can watch the ceremony in their classrooms. How do students get chosen to go to the ceremony? ELA teachers will be nominating their best readers from each class, and the media specialist will draw 30 names from that list. Or, students can create a Troybery project--if the project is chosen to be featured at the ceremony, then the student will be asked to attend. Students who attend the ceremony should wear their school colors and bring a bag lunch. Punch and cookies will be provided. They should also bring questions to ask the authors. It will be an incredibly fun event for all in attendance! It's time for Troybery madness 2018! The Troy Middle School Media Centers are launching Troybery Madness 2018! We are continuing our new format that we launched last year for our Troybery reading program, now in its 18th year. We have a field of 30 potential Troybery books, nominated by Troy students, teachers, and librarians—students will help us narrow down to the top ten through voting each week during March is Reading month. Books will be in competition just like the NCAA March Madness tournament, except that we will stop at the Elite 8 and do a vote for 2 wildcard spots to make it ten total. In order to vote, students will need to read at least 3 books out of the 30. Students have until Feb. 28 to fill in their brackets, so now is the time to really start reading!!! On the Media Center Schoology Group in the Discussion section, there is a place to submit the completed bracket. Even if students have not read all 30 books, they can still try to guess which books are going to win! Some of the awesome 2018 Troybery nominees. ​Once we have narrowed it down to the top ten by March 16, students will have time to read those titles in order to vote for the final Troybery winner on April 11-12. The Troybery Award winner will be announced live on April 27, 2018, at our annual ceremony. it's scholastic bookfair time at Smith! ​The Scholastic Book Fair will be coming to Smith's Media Center on November 27 - December 1. With the theme of Wild, Wild West Book Fair: Readers Wanted, our library will be transformed into the wild west with decorations from the Troy High National Art Honor Society students. Be sure to load the book fair app on your phone or on your child's iPad! This free app will give you access to videos and podcasts about the books that will be at the fair, along with summaries, reading levels, and prices. Students can create a wishlist using the app in order to show you what books they would like to buy. You can also order from the app or from our online bookfair November 17 - December 5, which has even more options available for purchase! Shipping is free, and your purchases will arrive at school in 2-3 weeks. Mrs. Chatel will contact you for pick up. We have released a list of potential Troybery nominees, and students are helping to narrow the list down to the top ten. 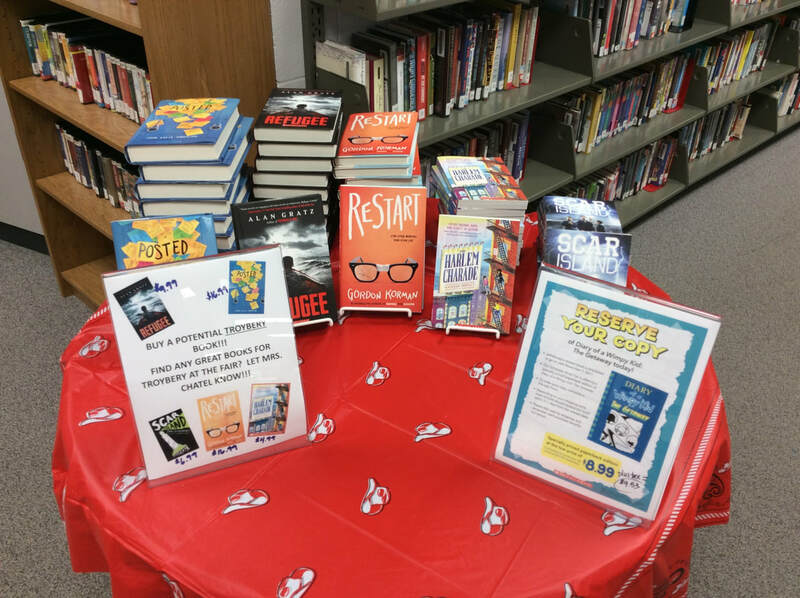 The following potential Troybery books might be at our book fair, depending on availability: Refugee by Alan Gratz, The Harlem Charade by Natasha Tarpley, Scar Island by Dan Geimhart, Posted by John David Anderson, and Restart by Gordon Korman. 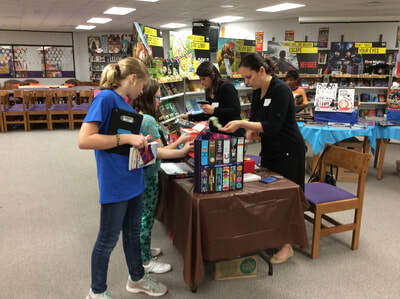 It's sometime difficult for students to get their hands on a Troybery book from our library because they are so popular--we appreciate you purchasing copies at our book fairs to enable your child to read more Troyberys! They make great holiday presents! Thanks for a successful book fair! Mrs. Chatel and Ms. Dodge in their Western attire! Yee Haw! 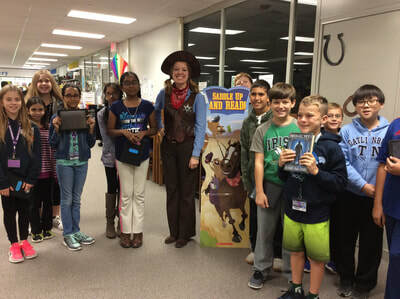 It was a fun-filled week in the wild west in the Boulan Media Center as students came to shop for books at the Scholastic Bookfair. National Art Honor Society students from Troy High provided some fantastic decorations. This year, sales were through the roof, thanks to your generosity! Thanks to the wonderful volunteers who staffed the registers during the flurry of sales! Mrs. Chatel will be able to purchase many materials, Troybery books, and even new furniture for the media center with the funds raised through the book fair. it's scholastic book fair time at boulan! The Scholastic Book Fair will be coming to Boulan's Media Center on October 16-20. With the theme of Wild, Wild West Book Fair: Readers Wanted, our library will be transformed into the wild west with decorations from the Troy High National Art Honor Society students. Students can create a wishlist using the app in order to show you what books they would like to buy. Then, they can send you the list to use to shop the book fair during conferences on October 18!! We will be open during afternoon and evening conferences. You can also order from the app or from our online bookfair October 8-25, which has even more options available for purchase! Shipping is free, and your purchases will arrive at school in 2-3 weeks. Mrs. Chatel will contact you for pick up. The new Diary of a Wimpy Kid: The Getaway will be available for paid PRE-ORDER at the book fair for $8.99 plus tax and free shipping! Mrs. Chatel will have the copies available in the week following the book's release on November 7. We have released a list of potential Troybery nominees, and students are helping to narrow the list down to the top ten. The following potential Troybery books might be at our book fair, depending on availability: Refugee by Alan Gratz, The Harlem Charade by Natasha Tarpley, Scar Island by Dan Geimhart, or Posted by John David Anderson. However, there may be books at the fair that are not on the Troybery list that should be!! If your child finds a book at the fair published in 2017 that s/he thinks should be a Troybery nominee, s/he can submit the title here. ​Thank you for your support of reading and the Boulan Media Center!